3.50" x 1.125" Direct thermal bright white coated paper label with an all-temp permanent acrylic adhesive. Not perforated. 2,374 labels/roll, 4 roll case. 3.50" x 1" Direct thermal bright white coated paper label with an all-temp permanent acrylic adhesive. Notches on left side, Printable area is 3.5' x 0.875'. Not perforated. 5,760 labels/roll, 6 roll case. 1.50" x 1" Direct thermal paper label. Not perforated. 5,120 labels/roll, single roll. Also available as a case (Part# 88686). 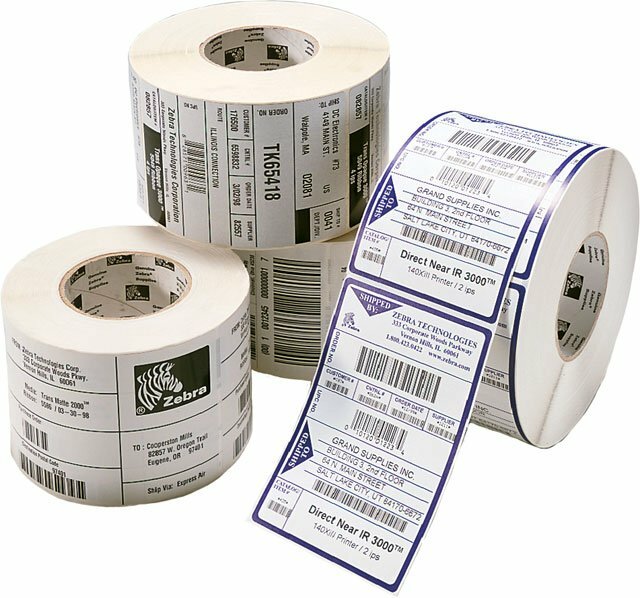 1.50" x 1" Direct thermal paper label. Not perforated. 5,120 labels/roll, 14 roll case. 3.5" x 1.5" Thermal transfer paper label. Kit includes 3 rolls of labels and 3 rolls of ribbon (Part# 05319GS11007). 1,570 labels/roll, 3 roll case. 4" x 2.50" Direct thermal paper label. Not perforated. 2,220 labels/roll, single roll. Also available as a case (Part# 72344). 4" x 2.50" Direct thermal paper label. Not perforated. 2,220 labels/roll, 4 roll case. 3.50" x 1" Direct thermal bright white coated paper label with an all-temp permanent acrylic adhesive. Notches on left side, Printable area is 3.5' x 0.875'. Not perforated. 5,760 labels/roll, single roll. 3.50" x 1.125" Direct thermal bright white coated paper label with an all-temp permanent acrylic adhesive. Not perforated. 2,374 labels/roll, single roll. Also available as a case (Part# 10013885). 3.5" x 1.125" Direct thermal bright white coated paper label with an all-temp permanent acrylic adhesive. Perforated. 5,219 labels/roll, 6 roll case.